Ubuntu is the third most used Operating System. Ubuntu is fast and secure and is backed up by a lot of free software. For blogging, there are some features and applications that are must. So, here is a list of all. 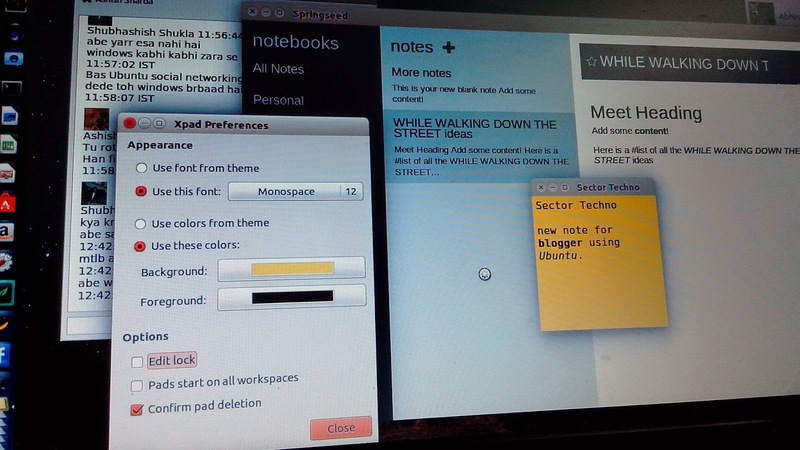 On windows and other platforms like Android, people use applications like Evernote. 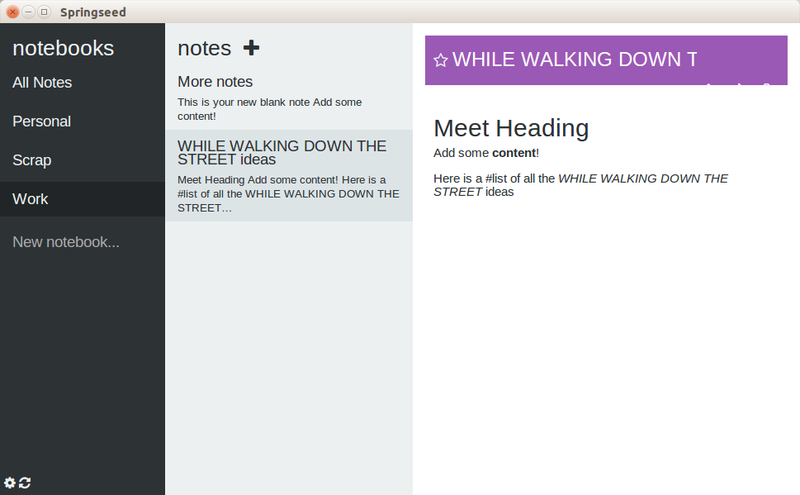 Evernote is a powerful note taking application. Unfortunately, Evernote is not available for Ubuntu. Therefore, we need to switch to other note taking apps. Springseed is best for blogger. Springseed has a very clean and simple UI. Other app like NixNote is also available, and NixNote/NeverNote uses Evernote's server to store data. So, you can access you notes from anywhere. Windows provide Sticky Note for making small notes and stick them to your system's desktop just like your refrigerator. Xpad is just like Window's sticky note app. Create notes, change color of each note. Type in whatever is important and close it without saving your content manually. Social Networking is very important for driving traffic to your blog. Creating and maintaining connections. Friends are not interested in your work, but other bloggers from around the globe are. 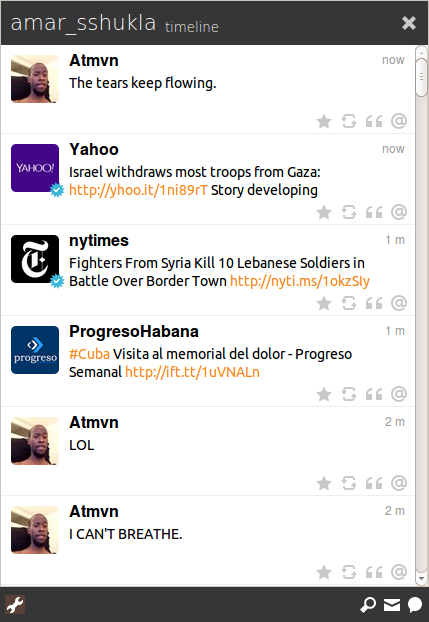 Turpial, is a Twitter client. This client will provide all basic feature to maintain a twitter account on the go. You can create columns of whatever is most important to you like your Twitter timeline or maybe mentions. You can update status on the go without even launching the app. Turpial get integrated with Ubuntu. You can set your own refresh time after with app will fetch new updates rather than getting instant updates. You'll get disturbed once. Status update will allow you to put permalinks, images, etc. Send direct messages. Images adds look and feel to a blog post. Also, meta tags in images are used to provide better SEO to an article. Images have to look good great and professional blogger even use royalty free Stock images. But, having control over the size of images are of great concern. Vector Editors are hard to use. You need to have good practise. But creating great illustrations can be done using Vector Graphic software. Firefox is default web browser but some user are comfortable only with Chrome web browsers. Such users can download and install Chromium web browser available for Linux disro. Available in Ubuntu's Software Center. Chrome browser goes with the name of Chromium in penguin's world. ThunderBird is default email client on Ubuntu. Again, there are other alternatives but not very good. ThunderBird got privileged by being a part of the Operating System. It can be customized with rich add-ons. Screenshot, is an inbuilt screenshot taking app. To create screencast, apps need to be installed. Again, there are a number of applications available. Kazam Screencast app is one of the best. Light weight, fast, and will help you in recording low size HD screencast. You can change FPS (frames per second) from preferences. FPS can be made to vary from 1 to 60 fps. WEBM, MP4 and AVI format videos can be created. You can also record sound from speakers(song playing on your system will get recorded) or microphones. Kazam also has an option to take screenshot.